Judy Bennett trained at the Guildhall School of Music & Drama. After a period in theatre with H M Tennent she began a successful career in sound. 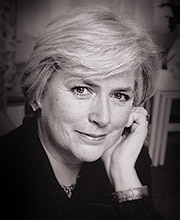 She has provided voices for numerous puppet TV series, among them Adventures of Rupert Bear, The Perishers, Denis the Menace and has recorded many audio books. For nine years she presented her own pre-school radio series Playtime but is perhaps most well known for her portrayal of Shula in Radio 4’s long running daily drama serial The Archers.